Brilliant image quality requires high colour brightness (colour light output), and Epson® 3LCD projectors have 3 x Brighter Colours than leading competitive projectors*. One brightness measurement (lumens) is not enough. A projector’s specification needs to show both high colour brightness and high white brightness. If colour brightness is lower than white brightness, images may be dark, dull and lose detail. 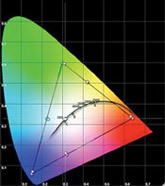 If not provided, be sure to ask for a projector’s colour brightness specification. Full HD 1080p resolution ensures the ultimate home cinema, while high colour brightness delivers vibrant image quality — whether it’s a blockbuster movie, live sporting event or videogame. With the included RF 3D glasses, the EH-TW9200 puts you right in the middle of the action. C2Fine offers smooth, uniform images with exceptional contrast for better image quality. Based on this new phase-compensation technology, light leakage is eliminated, and, when combined with the auto iris, this technology allows for contrast ratios up to 600,000:1. The Epson TW9200 features ISF certification for top video performance. And, it includes specific ISF picture memory modes, such as ISF Day and ISF Night, along with six other pre-named ISF memory modes and two additional modes. To prevent mis-adjustments that may inadvertently happen after installation and calibration, critical adjustments can be locked. To assist with properly adjusting colour saturation and hue (tint) using SMPTE colour bar test patterns, the TW9200 makes it possible to turn off the Red and Green imaging pixels, leaving only Blue. This allows the user to make adjustments without needing a gel filter. A Red-only mode is also provided. Enjoy thrilling 3D adventures right in the comfort of your living room. Featuring Bright 3D Drive technology, the TW9200 puts you right in the middle of the action. Epson’s drive system minimizes the blackout time of 3D glasses and provides greater brightness when viewing 3D content. Transform any 2D movie, from the latest science-fiction adventure to your favourite classic, to spectacular 3D. Or, watch the big game in exciting 3D. The TW9200 makes it easier than ever with convenient 2D-to-3D conversion. With just the touch of a button, you can watch your favourite shows and movies in eye-popping 3D. There are no special discs required. And, the possibilities are endless. Epson Auto Iris technology adjusts the aperture to provide optimum contrast and brightness for each scene.